One of the most fun things about working at Dr. King’s Farms is that no two days are ever alike. Interesting things pop up regularly, sometimes animals and sometimes so much more. For example, last week I was contacted by a local film company who needs to shoot some scenes for an upcoming film with a camel “extra.” Since we are the only people in town with camels, we got the job. The day of the shoot dawns and fortune is smiling on us as it is a truly glorious fall day. The sun is shining and not a cloud mars the perfect blue sky as the film crew rolls into our pasture. People mill about setting up camera angles, adjusting make-up and clothing and handing out snacks. Actors review their lines as Terry and George pull up in the truck toting the oversized camel trailer containing “Fancy Nancy” and her six-month-old calf, Penny. Fancy is a Bactrian camel originally hailing from northern Asia. She is pure white with two big beautiful humps on her back, standing almost seven feet tall and weighing close to 1,800 pounds. Upon seeing this, the film crew realized that the actor chosen to play the “Black Cowboy” in this film is not prepared to handle such a magnificent, huge animal. 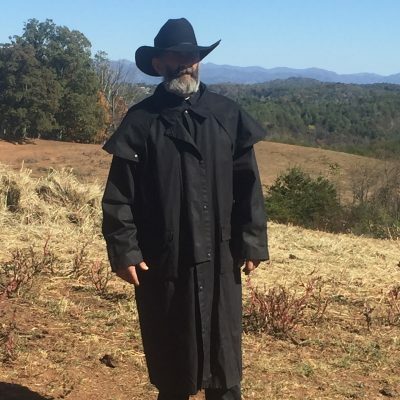 Terry, our trusty, grumpy farmhand, is quickly ushered into a black duster and matching ten-gallon hat, and before he knows what hit him, he is acting in a movie! He is given a few lines and some direction on where to stand, and the rest of us gather behind the camera and laugh at his predicament. 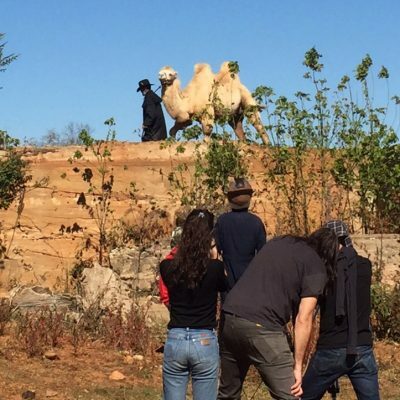 Filming goes on for most of the day while Terry leads Fancy about, trying to hit their marks for multiple takes of the scene, and Penny wanders in and out of the shots grumbling and honking the way a baby camel will, I suppose, when faced with a film crew. Finally, the perfect shots are recorded, everyone cheers and starts packing up the camera and props. The camels are loaded back into their trailer for the short ride back to the camel barn. That is also when the ribbing begins. Terry did an admirable job as a reluctant actor, but that still doesn’t save him from getting a new nickname, “Hollywood,” or being teased about giving us his autograph or what boots he plans on wearing when he leaves his prints in the sidewalk outside Grauman’s Chinese Theatre. Rena asks if Terry needs to take a nap after lunch so he can be fresh for his close-up and George teases him about keeping an eye out for paparazzi lurking in the bushes. We can’t help it. That is just who we are. Terry takes the fun and games in stride and laughs along, knowing that he will only be on the receiving end of the jokes for a little while longer … that is, until the movie is released in the spring.